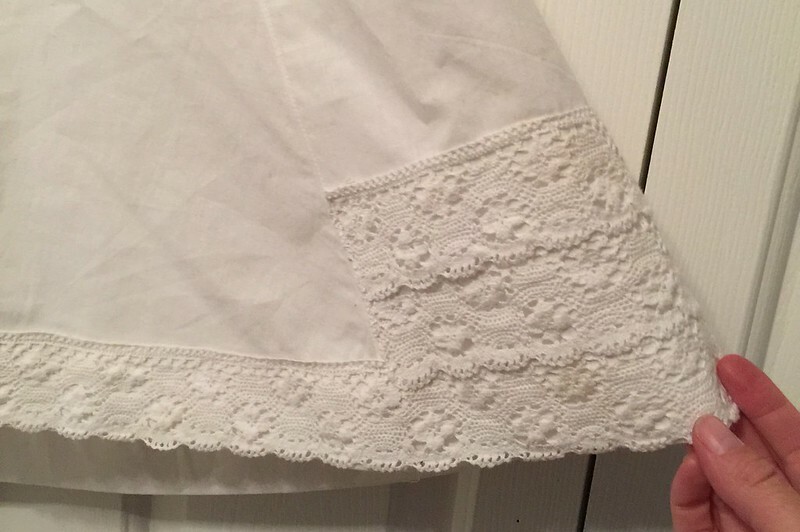 When I first started cutting the muslin, I meant to make it a completely plain white skirt, but, in true Victorian fashion, I couldn’t leave well enough alone, and several metres of lace found their way onto the hem. Still, after all the tucking and gathering and more gathering of the last one, it was a pretty quick and dirty affair. 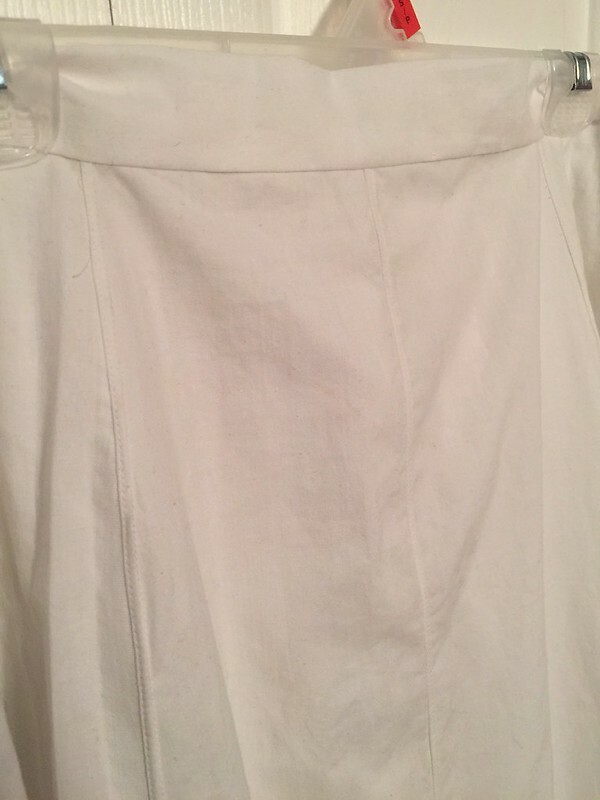 I used my flat-fell foot to fell the vertical seams, and I felt a lot more successful this time, if only because the muslin is like the best-behaved fabric in the universe. The main thing (aside from actually reading up on how to use the foot) is to use the right seam-allowances—1/4″ on the bottom 1/8″ on the top. Still not flawless, but mostly good, and no one’ll see the booboos anyway. 😉 Half my fells are on the inside, however, and half on the outside—after I screwed it up on the second seam I decided I didn’t care and just did whichever side was most convenient. Not the tidiest ever. BUT NO ONE WILL SEE. 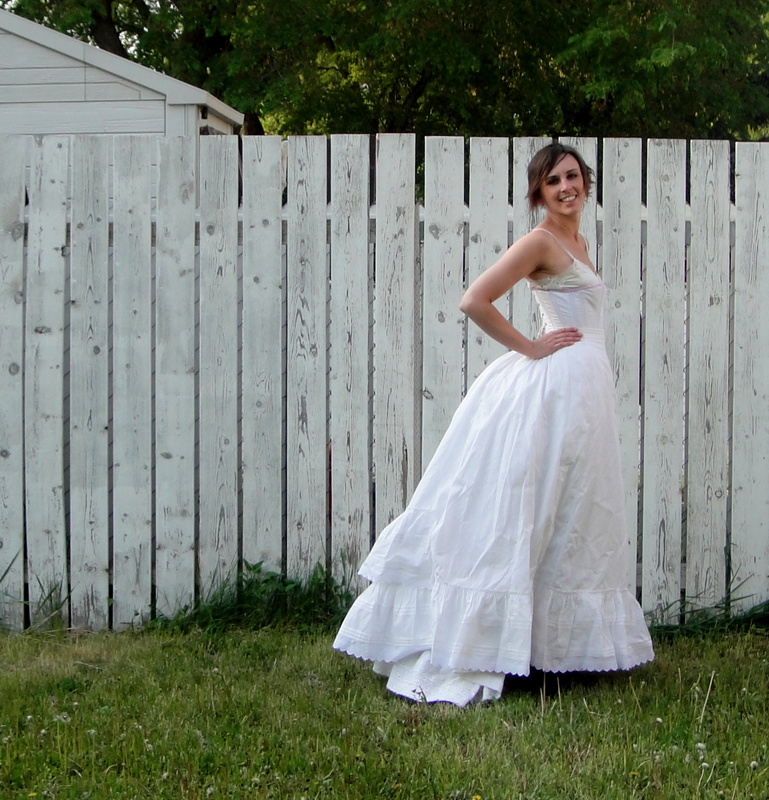 (Except everyone I show it to because I’m all like LOOK I MADE A PETTICOAT!) 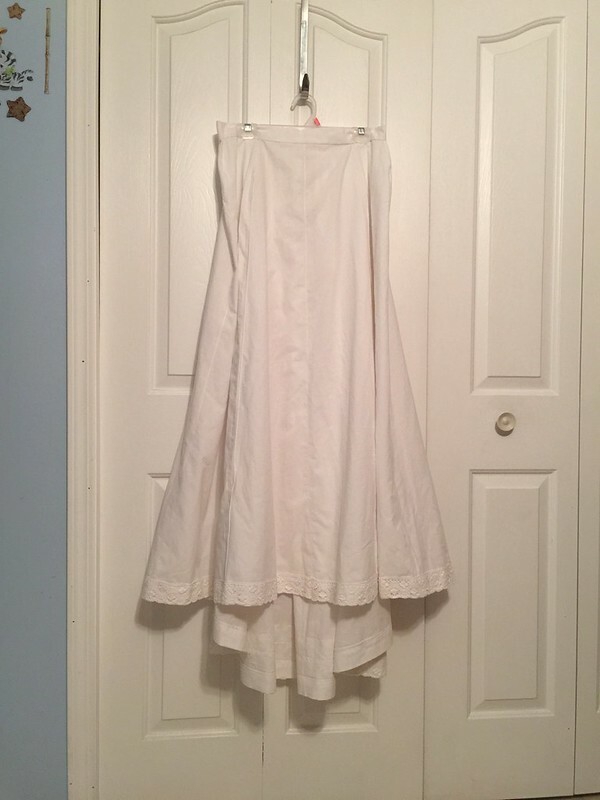 I used a total of three skirt-lengths of 44″ wide muslin. To reduce fabric waste, I added a centre front seam to the front gore. Initially I was going to use only two skirt lengths, but it would’ve been a really scrawny petticoat, so I scrounged around and turned up another piece of the same fabric, just long enough for another set of gores. 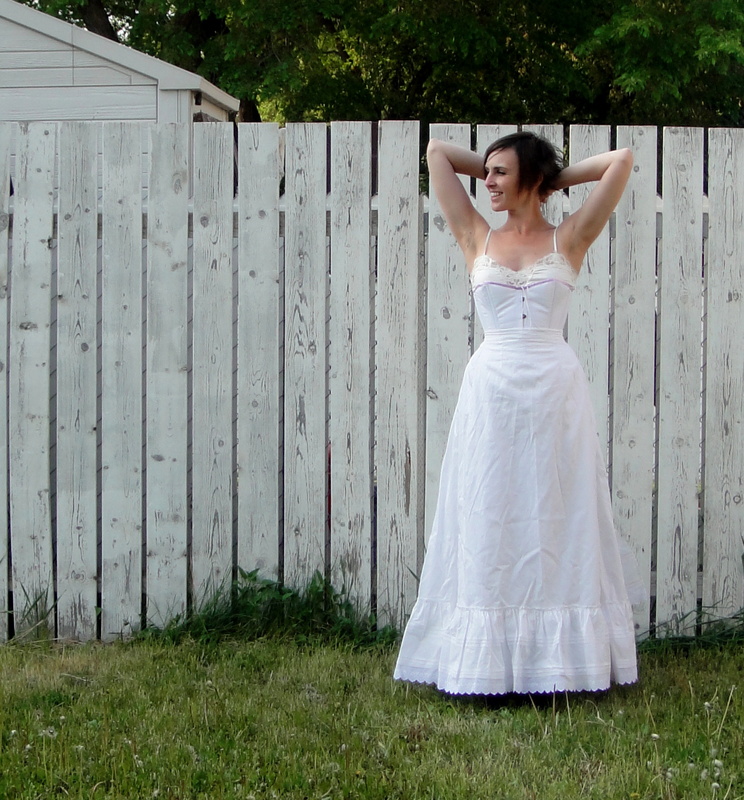 It’s more trained (long in back) than my previous petticoats, because one of the sets of gores I made was cut from a full 44″ width of fabric, not a half-width. This was not my best idea ever since I don’t particularly want a trained petticoat. Oops. I also cut the waistband little large, thinking it could sit a bit lower on my waist (and also not wanting another overly-tight waistband), but this doesn’t seem to work overly well for these skirts—the bustle gets in the way, I suppose. It looks kinda like one of those “look at my old pants!” weight-loss commercials. https://instagram.com/p/2zyEWwr0Mu/?taken-by=tanitisis Like the flannel petticoat, I made a folded placket in the CB. This time I put the narrow edge of the placket on top and the wide one beneath—this seems to work much better with all the gathering that is going on in a sort like this, although it’s pretty much opposite of the instructions. As I was trying to throw this together quickly, I was in no mood to try some stroked gathers (pity because I think I might’ve done better counting threads and things on the muslin)—I went with two well-spaced rows of machine gathering, although I tried a little extra-hard to make sure the stitches were as synchronized between the two rows as I could manage. I’m not too bothered, anyway. Aside from the waistband, I’m pretty happy with it, and it serves its purpose admirably. The hard bustle bone ridges you could see with just one petticoat are much better hidden this time. Skirts appears a little more full, I think. Although I’m noticing more “skirt spread” now, angling out of the front part of the skirt. Not quite the 1880s fashion-plate look, although pretty common in actual period photographs. The solution, according to Mrs Church and others, is ties or elastics that run across the inside of the skirt, from one side to the other behind the knees, pulling everything in. This would require adding little slit-type openings to all the petticoat layers for the ties to pass through… We’ll see. It then occurred to me that I’m taking photos in my back yard in my underwear. Teehee! Alas, my attempts to vamp it up Victorian-style mostly came out looking more “axe murderer” than “come hither” (a problem I often have…), so you’ll have to settle for a peek of ankle. *Yes, as you may have noticed, I have also made another corset. It, like the petticoat, is very boring. I will blog it as soon as I get the chance, I promise. 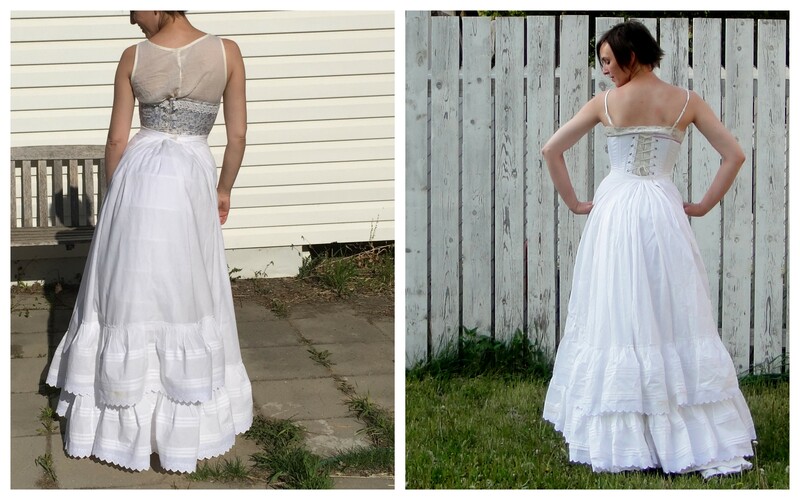 Yes okay, it might be a boring petticoat (I personally disagree – look at that pretty lace! The felled seams! SO COOL), but boy does it make a difference when paired with the fancy smancy one! I don’t know what I’m looking at and even I can tell it’s much better! Lovely and not the slightest bit boring! I did notice your new corset and I don’t think corsets are ever boring so please blog about that too! This petticoat isn’t boring at all. I love the lace. And I had no idea there was such a thing as a ‘flat fell’ foot. I’m looking forward to seeing your outfit evolve.